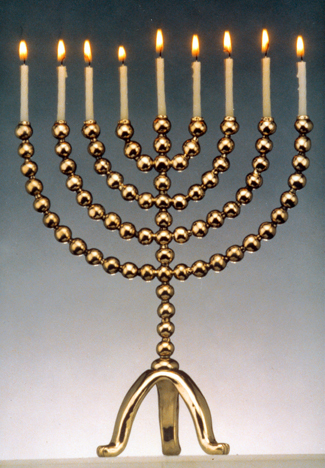 Babette Bloch's Bronze Menorah was inspired by ancient floor mosaics found in Israel at the temples of Maon (600 C.E. ), Hammath (3-400 C.E.) and Bet Alpha (600 C.E.). When visiting these historic sites, Ms. Bloch became fascinated with the temple menorah's motifs of pomegranates and lions feet. The pomegranates symbolized productivity and fruitfulness. The lions feet symbolized strength and eternity. Ms. Bloch has utilized these timeless images to create a Hanukah Menorah of unique spirit and beauty.